The MTRC issued a press release (pdf) highlighting their green light from the Government to proceed with a detailed proposal for the scope, cost and implementation of the West Island Line. The West Island Line is an extension to the MTR Island Line and includes the addition of three more stations to the west of the existing Sheung Wan station. The additional stations are Sai Ying Pun, University and Kennedy Town. The new line, once completed will provide a great boost to the station areas and neighbourhoods in the vicinity and should lead to an increase in property prices in the area. According to the timeline provided by the MTRC, the construction work will begin in 2009 and is expected to be completed by 2013-14. 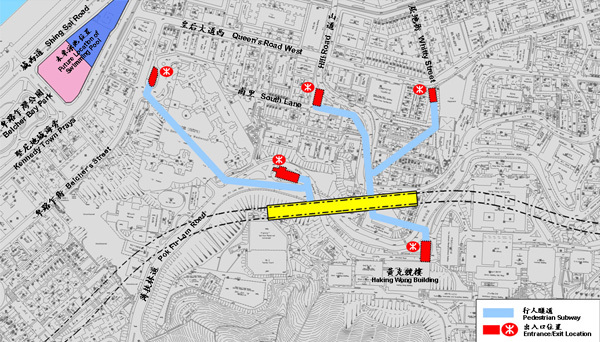 Sai Ying Pun station will be the first station beyond the existing Sheung Wan station. 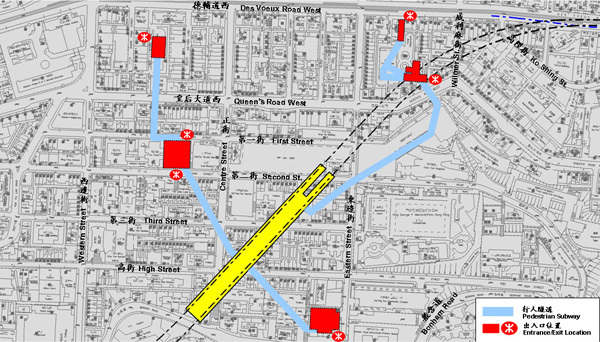 The below image shows the proposed station exits for Sai Ying Pun Station, including an exit on Bonham Road near the intersection of Park Road and Bonham Road. The University site will provide direct MTR access to the University of Hong Kong and the surrounding residential areas. Kennedy site will be the most westerly station on the MTR Island Line. From the point of view of an investor, the areas to be serviced by the new MTR West Island line will become more convenient to the business districts of Central, West Kowloon, Admiralty and Wanchai/Causeway Bay. Kennedy Town will enjoy the easier accessibility and demand for property from end-users should increase. 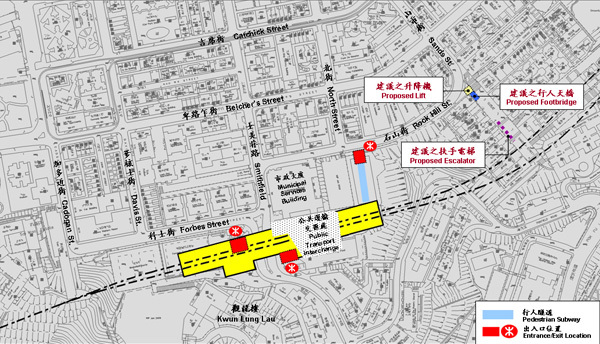 An important element will be the Sai Ying Pun MTR entrance on Bonham Road in Mid-levels West. This will provide MTR access to those living around Park Road, Babington Path, Lyttelton Road and the western end of Conduit Road. Currently, Bonham Road and Caine Road are congested during peak hours so the West Island Line should help to relieve some of this pressure. This entry was posted on Sunday, September 7th, 2008 and is filed under Urban Development. You can follow any responses to this entry through the RSS 2.0 feed. You can skip to the end and leave a response. Pinging is currently not allowed.